You and I may not like reptiles but there are other creatures that just love them. Reptiles are a major food source for many predators and this post is about Reptiles of Rajasthan found in the Tal Chhapar wildlife sanctuary. One question that has haunted me since we reached Tal Chhapar was why all these eagles come here when they could be anywhere. 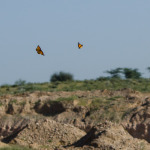 Some of the answers to the same were it is safe to be here, it is on the way to Kutch in Gujarat where they are going, but I think the biggest reason the eagles come to Tal Chappar is a large colony of reptiles specifically Spiny Tail Lizards. 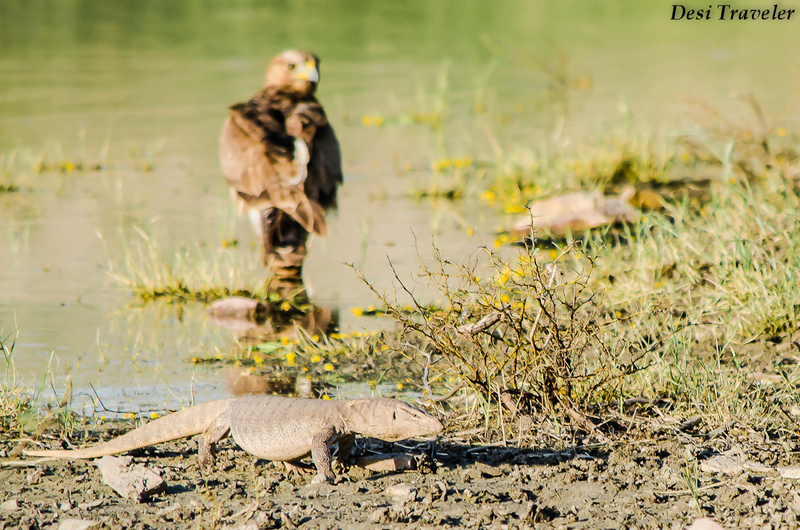 Though monitor lizards are also found in Tal Chhapar we are talking here about the spiny-tailed lizards that are full of fat and all predators right from our cunning fox to the migrant and resident eagles actively hunt for food. And where there is ample food supply predators are bound to flock. Mr. Poonia took us to an area where literally there are hundreds of spiny-tailed lizards lazing in the grass next to their borough and munching on the grass. Yes, they are vegetarians and must be one of the few reptiles that are vegetarian by choice they munch on the stem, and tubers, seeds, and fruits of the different grasses like “ mothiya” and trees found in the scrubby area. The moment they see somebody or listen to the sound they vanish into their holes. I tried my best to get a close shot of some of the lizards but was not successful. 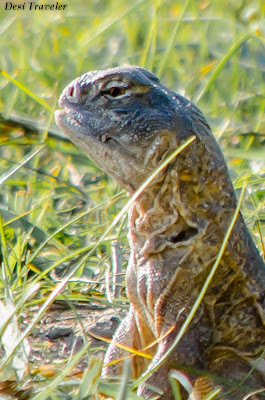 Though the lizards (scientific name: Saara hardwickii earlier classified as Uromastyx hardwickii) are very agile but there are times the Eagle is faster than the lizard and will catch the lizards in their talons and perch on a branch to slowly enjoy the fatty reptiles. 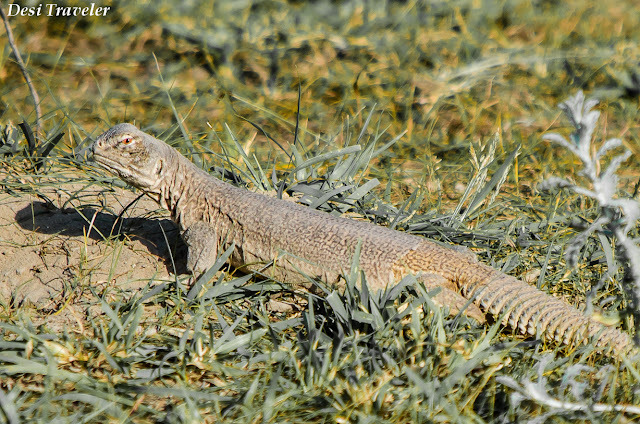 Well somebody got to be at the bottom of the food chain and in Chhapar it is the poor spiny-tailed lizard. 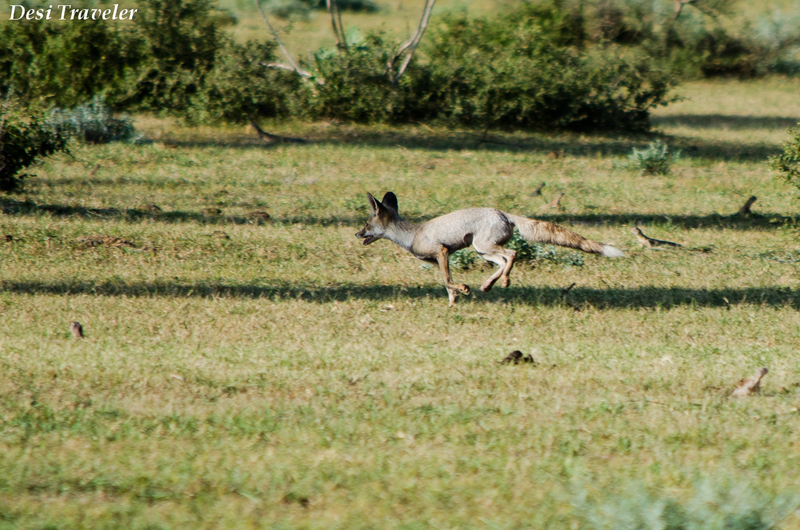 Besides the eagles the foxes also love them and we saw another fox trying to catch one, she was surrounded by so many lizards that she was spoiled for choice. It was like the cunning fox was been invited for a lizard buffet. Can you count the number of lizards in the picture, and this is after I have cropped most of it to get closer to the fox. 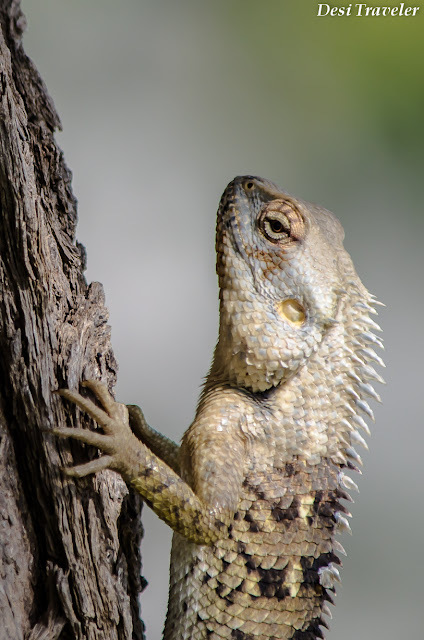 The same Spiny-tailed lizard is called Sanda ( सांडा ) in Hindi and is sold by poachers in the market as an aphrodisiac claiming that the tail of lizard has an oil that can cure erectile dysfunction. Although there is no scientific basis for this belief that Sanda oil is good as an aphrodisiac, but poachers continue to capture and kill the lizards for fat in its tail that is a source of oil and for meat. I wonder if they have heard about the little diamond-shaped blue pill? 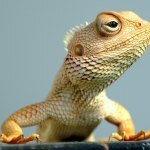 That may save the life of some Spiny-tailed lizards. To know more about Spiny Tailed Lizards read here. The other reptile found in the area is the Monitor lizard (Varanus bengalensis) which is much larger and a carnivore; I have actually seen pictures of a Monitor lizard eating a spiny-tailed lizard. Talk about a lizard eating lizard world. The monitor lizards are ferocious and we saw one of them next to a water hole passing majestically next to a big eagle, not sure if the eagle already had a tummy full or was scared to attack the Monitor but he just looked at the monitor from a safe distance and the monitor just passed by not worrying at all about the eagle. 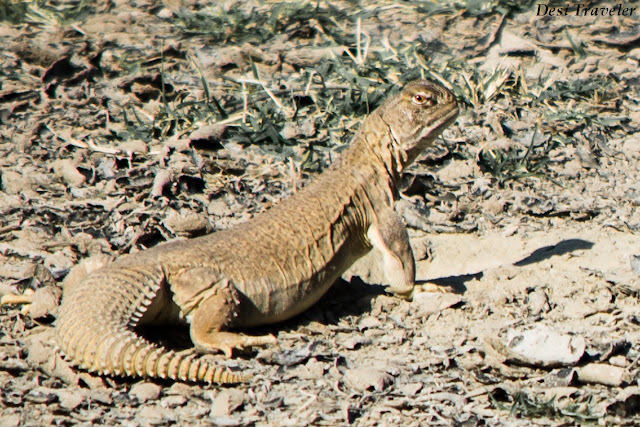 What a difference it can make if you are the top dog… I mean top lizard while the spiny tail will vanish on the slightest hint of danger one of the monitors we saw continue to bask in the sun on the small mud dam next to the watering hole even after noticing us. There are other smaller lizards in the sanctuary like the agama, garden oriental lizard but most of them are too small and shy to pose for the camera. Among the limbless reptiles, many snakes live in the sanctuary and I saw my first snake in the wild a common Sand Boa ( Eryx johnii – scientific name ) who was too shy to pose for pictures. Soon it was time to return to the guest house where Vandana and Sharad our wonderful hosts who run the Tal Chhapar forest guest house had ordered yummy Kachoris for us, that you will not find anywhere else (another reason to return to Tal Chhapar). 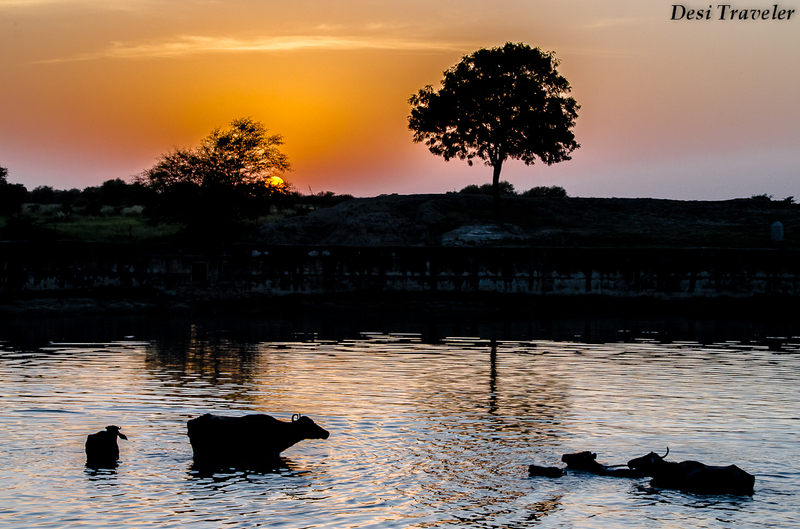 While returning I saw some buffaloes in the village pond and captured this sunset. 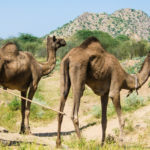 I hope you have liked this post on reptiles of Rajasthan, and will be on the look out for same besides the birds when you visit Tal Chhapar wildlife sanctuary. Thanks for reading feel free to share, comment and subscribe there is more in the pipeline. Thank for showing us an interesting part of and interesting sanctuary. One interesting post, Desi Traveller. Thanks D.Nambiar…mother nature has so many hidden treasures, let us hope we will discover them before we destroy them. Who knew they lived next door? Nice work. Hi Shovon… your observation comes at a very appropriate time when we have international biodiversity conference in Hyderabad. 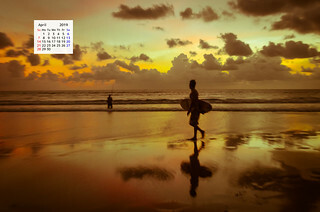 Amazing pics, Prasad! Wonder how did you manage to click them!! 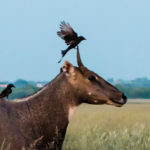 Thanks a lot Amitjee…I have a basic 300 mm lens but it takes one fairly close to the beautiful creatures without disturbing them. 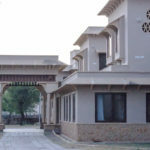 Vandana: We really enjoyed the stay at the Tal Chhapar sanctuary and the forest guest house that is so well managed. We are definitely planning to come again and bring kids also. Those kachoris are the best I have ever had, so was some of the local rajasthani food served. Prasad, you have been the most generous guest I have ever met. I could have never imagined that the most reticent of the entire group was a man of sooooooooo many words. You seemed to have really soaked in every second at Talchapar…and your breathtaking descriptions definitely call for a personal invitation to you from Sharad and me to Talchapar again.